Looking for a tropical getaway within the city? This condo in Taguig boasts facilities that give residents a taste of resort living, perfect for leisure-seeking couples and barkadas. When looking for locales to call home, smart chicks always consider accessibility from main thoroughfares and proximity to the office or a mall. But to score on both counts and wake up each morning as if you were in a luxe tropical resort? That's a blissful treat every hardworking Cosmo gal is entitled to! The Royal Palm Residences is one such paradise in Manila's bustling metropolis. It offers its homeowners creature comforts that set it apart from traditional residential establishments. Located in Taguig City, this condominium draws inspiration from the aesthetic of Thai architecture while infusing leisure pools, water cascades, and ponds to create a tranquil atmosphere for its residents. You also get the best of city living with Royal Palm's amenities set over a sprawling four hectares. Whether you're shacking up with your beau or sharing a space with your buddies, there's never a reason to be bored when you have 13 indoor and 22 outdoor facilities to choose from, including a fitness gym with a dance studio, a sauna, a billiards room, an entertainment room, a bar, and more. Plus, it's close enough to Bonifacio Global City and Makati and near some of your favorite shopping destinations! Launch the gallery now for a virtual tour of this recreational paradise right at the heart of the city. 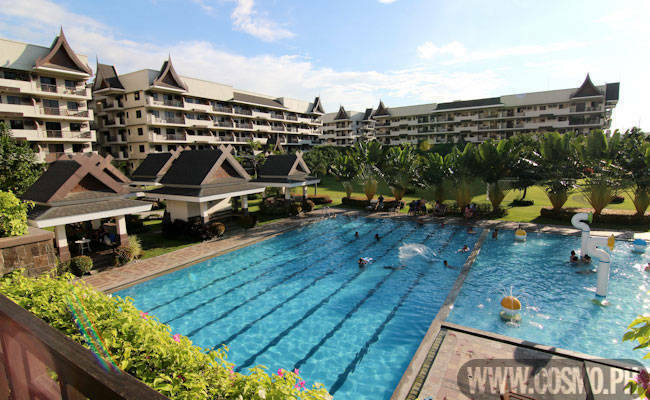 Royal Palm Residences, located at Acacia Estate, Taguig City, Metro Manila, Philippines (Near Bonifacio Global City). Contact them through mobile: (+63917)859-7926, landline:(02)211-1579, or e-mail: royalpalmresidences@gmail.com. Visit their website, royalpalmresidences.net, for more info.